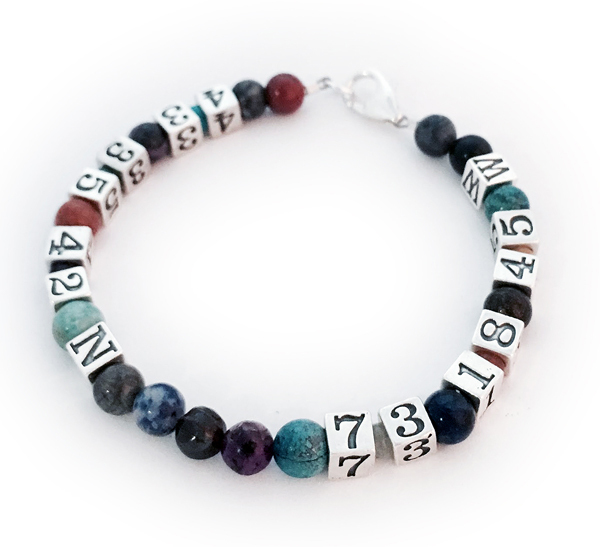 This bracelet has 5.5mm alphabet block letters and 6mm real "Multi" gemstones with 6mm real gemstones in between the number sets. Coordinate Jewelry has the GPS Coordinates of a special place or a place with a special memory. It could be the birth location of a child or where your husband proposed to you or where you went on your honeymoon! You may put the latitude and longitude location of a place with you hold deep in your heart or a place you want to go. A vision board you can wear! Up to 16 letters and numbers are free PER STRING. Additional letters and numbers are $3 each. If you have questions or would like to further personalize this Gemstone Bracelet call or text me 615-490-2177 with questions or to place your orders.